As the year comes to an end and the new hunt begins on Thursday, it’s time to look back at the five stories from the 2014 St. Louis Cardinals season that still sift around the cerebellum two months later. The gleaming smile is the first thing I remember when I met Oscar at the Winter Warmup this past January. The kid grabbed your attention before you could click the recorder on your IPhone on. He arrived in our minds a few years ago. He arrived in the flesh on a fateful bittersweet rainy afternoon at Busch in May. Michael Wacha was pitching(a man who literally brought the rain in 2014). The score was zeroes on each side. 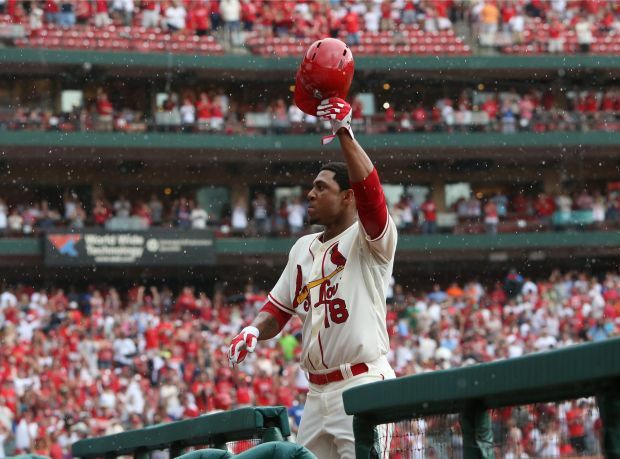 Taveras stepped to the plate and with one majestic Thor like swing, sent a baseball into the right field stands and implanted himself in the hearts of Cardinal fans forever. Like every movie trilogy with a great entry film, the sequel(June-August) couldn’t live up to the expectations of that one swing. However, in his second to last at bat in the National League championship series, Oscar hit a pivotal home run off the same team he hit the first, The Giants. He saved the best for last. He hit the ball nearly into the same spot in October. The crowd roared. The hope grew out of the concrete again like fresh spring weeds. This was a sign of the future. Suddenly, later that month, Oscar was taken from us due to one horrible decision and his career will never be allowed to unfold. All fans and writers will have is that memorable smile and streaky yet monstrous home run swing. “You Never Know” hasn’t stung this hard in years. Before 2014, Lynn was a winning pitcher. The baseball card mafia couldn’t touch him. He did his thing and was quiet off the field like a sniper. This past season, Lynn became a different pitcher. He didn’t rely on strikeouts. He didn’t blow up at the first sign of trouble. He completely shut down a team(Yankees in May). He had an identical record from 2013, with 15 wins and 10 losses. His earned run average lost weight though, dropping to 2.74 from 3,97. He threw more innings(203.2) and he was worth 3.1 wins above his replacement. He struck out 181 and walked 72 in 33 starts. Guess what? He got lethal down the stretch. After subpar second half performances in 2012 and 2013, Lynn got sharper as the calendar stretched his legs in 2014. Lynn didn’t just get better in 2014. He gave the Cardinals a reason to believe in his future. The neon money sign above his right arm clicked on. He supplanted himself as a potential heir to the throne that Adam Wainwright currently carries. Big step for Lance. The 2014 season saw a flurry of conversation about who should hit leadoff. After Matt Carpenter didn’t blast out of the cannon as quick after an unreal 2013 season, there were calls for him to drop down in the order due to his RBI ability or lack of speed. Well, he didn’t do that bad. He got on base 37 percent of the time, which makes his .272 batting average meaningless. He scored 99 runs, collected 162 hits and bashed 33 doubles while driving in 59 runs. He played in 158 games and was as durable as a handyman(I couldn’t resist). However, after all that, Carpenter saved his best for last. He hit four home runs in the postseason and drove in 8 runs. Timely doesn’t begin to explain his deeds. With the team down in game 1, he cranked a solo home run off Clayton Kershaw(the eventual Cy Young Award winner). He then blasted a bases clearing game changing double in an eight run 7th inning. In Game 2, he accounted for the only two Cardinal runs with a two run game tying eighth inning home run of J.P. Howell. In Game 3, he hit a home run off Hyun-Jin Ryu. Carpenter had a slugging percentage over 1.000 and did all of that from the leadoff spot. He did this for just over a million dollars in salary, fulfilling a promise to Cardinals management for giving him a six year extension earlier in the season. Carpenter is money no matter where he hits in the lineup, but I would suggest leaving him in the leadoff spot. Sure, there are three years left on the deal, but Jhonny Peralta made an impression in 2014. He drove in 75 runs, hit 21 home runs, and slugged 38 doubles. He put together the highest WAR(5.8) of his career. His defense was solid before the arrival in St. Louis, but the finish was more fine than expected from my point of view. He made more plays than I thought he could make and kept the errors down. With Peralta, it was silky smooth and efficient. There was no flash needed. He looked like he could fold clothes out of the laundry as he made the throw to first base. Peralta got a big money deal for a man coming off a PED suspension. The gamble, so far at least, is worth the risk. Peter Bourjos came over in a trade for David Freese and half the town anointed him the center fielder. He said he would steal 40 bases at the Winter Warmup. He came over with the support and hype of a seven time gold glove outfielder(hint, he is not). Jon Jay began the season as a backup. By the end of the season, Jon Jay was the center fielder and backed it up with his consistent bat and improved defense. Jay had a .378 on base percentage and put together his third .300 average hitting season. He was an overall 2.8 wins above replacement and his defense was much better than the 2013 debacle. He was a lethal weapon against lefthanded pitching, hitting .375. Jay also calmed another harsh critical crowd when he collected 14 hits in the postseason. Jay gets nearly as much flack around St. Louis as Matt Holliday, but has developed into a consistent bargain producer for the team. He isn’t going to crank a lot of home runs or dazzle with his glove, but he will earn his at bats and do whatever is needed. Yeah, and he also gets on base a lot and collects a lot of hits. 2015 will begin with Jay in center field and Bourjos as a useful weapon off the bench. No debate required this time. That’s all folks. 2015 awaits and will thankfully torture fans with more unforgettable moments, long bouts of frustration and inevitable heartbreak. 2014 is in the rear view mirror. The upcoming season has a whole new bag of tricks planned. Are you ready? I am. See you next time.